© Copyright J C Ousby and licensed for reuse ounder this Creative Commons Licence. 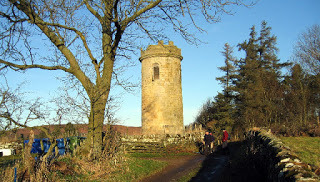 ‘Sharp’s Folly, or Tower, is reckoned to be the oldest folly in Northumberland. It is situated near Whitton, a little to the south of Rothbury, and was built in the 1720s by Rev Dr Thomas Sharp, Rector of Rothbury during 1720-58. When Sharp (the son of the Archbishop of York) moved to the locality he set up his household in Whitton Tower. He was something of an eccentric, for sure, but, taking pity on the unemployed men of his parish, he hit upon the idea of building the 30-odd foot high ashlar structure as a sort of job-creation scheme. It wasn’t a folly in the purest sense, though, for the tower, after its construction, was thereafter used as an observatory for the reverend’s astronomical interests. You could see the sea from its summit, apparently, until the nearby trees grew to obscure the view.